How was all y'all's New Years? Good? 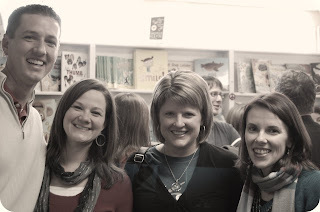 Bree Despain's launch party was on Saturday at the King's English (indie bookstore in Salt Lake City). Bree packed the house, and the bookstore sold out. I've never seen that happen. 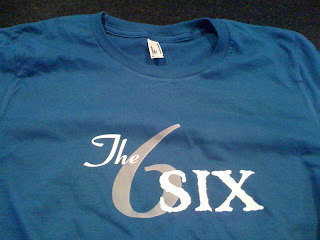 Our writing group's official t-shirts came in. I went into the back room of the bookstore to change, and when I finally squeezed myself in (using a shoe horn and a nearby oil slick), I realized what Valynne meant by "they run a little small". I looked at myself in the mirror, and I could read the make and model of my bra. So I put a v-neck black shirt over the t-shirt. But I still wanted to feel a part of my critique group, so I pulled down at the "v" and flashed everyone wherever possible. Not only was it gratuitously tight, but I made it worse by looking like a flasher. After I flashed Matt Kirby, he said, "Brodi, you have turned awkward moments into an art form." 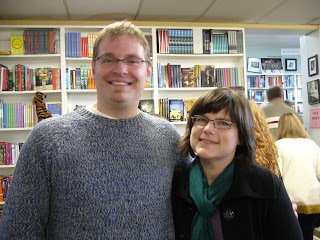 I met a lot of blog readers in person, so thank you to all of you who came! 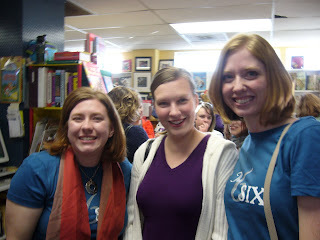 Here are blog readers Mary and Alana with Emily Wing Smith. Here are Ben Ballou, Cam Ballou, me (in my v-neck, in a rare moment of non-flashing) and Heather Zahn Gardner. Ben, Heather and I went to Junior High school together. me: "Elana, this is Kim. Have you two met?" Elana: "Um, Brodi, Kim and I have been in the same critique group for years." me: "Right. Sorry. Here, have you met Bree?" Elana: "Years ago. In our critique group." 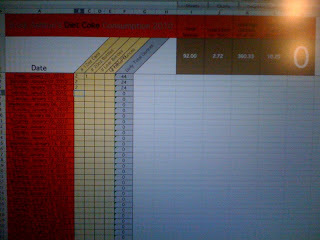 Finally, blog reader Robin (who lurrrves spreadsheets) sent me a custom made spreadsheet to document my Diet Coke intake in 2010. Isn't that nice? I was trying to explain it to my family, and I was all, "It's got like, a bunch of columns, and a bunch of rows, and I put in a number and it magically gives me another number. It's in a program called Ex-ell. Exx... celll... or something." I told them I wanted to show it on the blog but I had no idea how. My bro-in-law D says, "Lemme guess. You took a picture with your iPhone." Do you see the awesomeness that is the spreadsheet? Can you imagine the depression at the end of this year if I'm vigilant and record every diet coke? The last column should read "percent chance that your skin will fall off due to over consumption". How was everyone's New Year? Do your kids start school today like mine? Are you jumping for joy too? Yay for Bree! Hilarious post, Brodi. I posted a link on the Tenners site. With a warning: DO NOT CLICK IF YOU'RE OFFENDED BY THE WORD 'BOOBY.' Hahah. Yay! It was so fun! Oh and there's me double chin and all - hmm. Seriously it was fun and Bree did a great job. So good to see you and meet The Six - so awesome how you all support each other. Yay again for kids returning to school. Josh- That disclaimer should probably go on all my posts. Thanks for linking! Mary- So good to see you too and meet your friend! Sal- I totally felt it. The collective jumps for joy from moms across the Salt Lake Valley. It looks like a great time! I wished I could have made it but alas, illness prevented me. I will be curious to see if the Diet Coke consumption actually breaks that spreadsheet. Can a spreadsheet just simply implode? I may have to steal that spreadsheet and use it for my Tab consumption. That would be simply awesome. I love our boys but it is good to have them back in school. We need them to be in school, so that they graduate, make lots of money so that we can retire and live off their paychecks. Sounds like a serious party! Kudos to Bree! Cannot imagine a revision process like she hers. Wow. whoa. wow. And come on... Excel? Weren't you like the undercover math geek in high school? I swear you knew your stuff better than anyone. Wasn't it me that avoided math like the plague all through college? I thought you aced calculus. Set me straight. Don't you have a secret affinity for math/science? Sam- The spreadsheet will not implode. It will, however, give me a guilt trip when my consumption reaches a certain critical level. The little computer voice will say, "Brodi. Why. do. you. do. this. to. me. Can't. handle. the. numbers. goodbye. cruel. world." Cath- you are very correct. I love me some science. And calculus. But I do not recall there once being any sort of chapter on "spreadsheet creation and maintenance". Ask your hubby. Mrs. Keir talked conics, fractals and limits. But never once did she mention spreadsheets! And in my million+ hours of watching science fiction shows like BSG, Star Wars, and Star Trek, never once did Admiral Adama say, "Let's pull it up on the spreadsheet and see what happens." I really feel I should clarify, lest one of your loyal blog followers meet me and be sorely disappointed, that I was jesting about the "ample rack." Also, mentioning the jar in writing makes the offense double, so pay up! Of course after Josh said not to click if you're offended by the word booby, it was like I couldn't stop myself from clicking. The mouse moved all on its own! Sounds like it was a really fun launch party! Emily- You're right. After your comment, you owe the jar 50 cents. I just clicked on the Tenners site (love sitemeters) before checking in here and bust up laughing! See I would have fir into that shirt perfectly, no shoe horn needed. fit, not Fir. I can type as well, it is one of my many multi-tasking talents. I have to admit Bree has definitely made a good case for #1. Sam, seriously. Tab? No one drinks Tab anymore. Most people don't even know what that is. I'm sure Ben could Wikipedia it for everyone, but still . . . Tab? Brodi, I love the spreadsheet. 1. Ben is so freaking tall!?! WTH? I even had heels on. 2. Your rack was fabulous, tight is only a no-no on the bottom end of the shirt...muffin top = bad, cleavage = good. 3. Excel? Your're killing me smalls! (Name that flick) I live and die by that program. It's the Cheese to my Mac! It doesn't write books for you though, in case you wondered. Damn. Valynne--You will be lucky if I talk to you in the future due to your slanderous attack on Tab. Quick Tab Fact--one of the first 3 diet drinks to hit the market decades ago (Fresca and RC Cola were the others)and it is still as tasty and fabulous now as it was before. Valynne- That's three votes for Bree. And I can't believe you haven't heard of Sam's love affair with Tab! He single-handedly keeps them in business. People who know us give us presents like 6-packs of Tab for Christmas, and Tab paraphernalia. Personally, I think it tastes like medicine. And pee. Cam- "muffin top" = ha ha ha! So you have heard of this thing called "Exx-cell"? What are the chances that two of my blog readers know of this obscure little program? Sam- Thanks for showing these nice folks why I fell in love you. It doesn't get any hotter than when you ramble off lame Diet Drink trivia. "Lame Diet Drink trivia?" There is nothing lame about Tab...Also, everyone is fascinated about its origins. Obviously I don't know where math ends and accounting begins, eh? I'll ask Doug. (must be why he stopped talking with me about his work years ago... that glazed look in the eyes doesn't do much for conversation.) Also - meant to tell you, turning awkward moments into an art form is a rare talent. That's quite the compliment! Go girl. Congratulations to Bree on such a wonderful signing day! I was there with my 3 year old son and stayed for a good 90 seconds in fear that my son would tear down the place. But a good samaritan gave me her book to read (I think just to get me out of there). So I look forward to a good read! Yeah! The kids went to school today! I can be a good mom! So long as I don't keep track of the Diet Dr. Peppers I drink. Forget the Diet Coke! Also, totally random...I just bought my first iron ever today! I don't know why. We haven't used one in years...but it was on sale. Go figure! Sam- I enjoy the couch every night. Cath- I'm thinking of taking my talent of Awkward Moments on the road! Erin- Your first iron? Ha ha ha! Congrats. I still have yet to buy one. What is wrong with us? We come from a mom who irons her sheets. Why are we so weird? Melissa- sorry to make you sad! 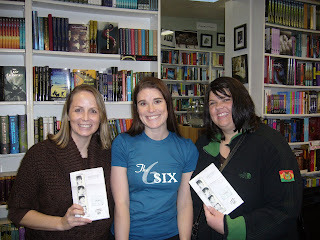 Since we just heard Bree's book is going into a second printing, I'm sure there will be plenty more signing parties. Whoa, how cool am I to make your blog? I guess I'll even have to break down and be the twentiumptieth commenter. Commentor? Except you spelled my name wrong. That's ok. Everyone does. You're so efficient, Brodi. I've only just begun to think about actually writing a blog post on the launch party. And I'm sorry for walking right past you like you weren't there. You were always across the room or talking to somebody when I saw you before that moment, and then when you were actually available, my head and my brain they didn't bother to get together. It was a crazy party. Pretty exciting. We should have taken a picture. I knew it was spelled Elena! Oh man, I have it on my blog roll for Pete's sake. I see it every day! Anywho, very fun to talk to you. But when did you walk right past me like I didn't exist? Now that I'm aware I was slighted, I feel slighted! Next time we'll definitely get pics together. Hey how fun, Mary and Elana kept me and my friends company out in the other room since it was SO crowded we were were multiple rooms of the bookstore. Such a fabulous party! And I must say I'm glad I got to experience the v-neck flasher in all it's glory. In fact a few times. And I even saw your sister but that explains why when I went over to say hi she was already gone. It took me a bit longer than 90 seconds to make it across that crowded room. Good luck with the booby jar earning money for the cruise, after Bree's post of the hubbys meeting it'd be hilarious to see what they'd all do with a week together. Debbie- That was so fun. I barely saw Erin too, but I saw her long enough to see Asher smear frosting all over the carpet. You and your friends definitely know how to make a party. If I ever get a book published, I want you to head up the party committee. Melissa- Thanks for letting me use the photo! Bree just sent a link of the FB pics that had her tagged, so I'll be sure to... what's the word... attribute? Compliment? You know what I mean. I hate to say I've become a lurker again, but I have. I'm finally caught up on your blog, it's been a crazy month. I will say it now: I don't know if I've ever laughed as hard as I have for the last hour it's taken me to read through December! You are one funny lady! I started school today like your kids. Also, if you want to take a picture of a spreadsheet, just hit the "Print Screen" button on your computer. Then it won't look like you took it on your phone. The shirts are awesome, even if it made you flash everyone there. I also got to hang out with Mary and Elana. We were crammed around the refreshment table straining to hear Bree speak. Glad we made it in for the reading & Q&A. I'm taking one of my YW to the WJ signing so I'll get to here her speak then too. It was a blast & good to see you. Even for a quick second! Kimberly- Welcome back to the blog! I know a lot of people basically took December off from my blog, so I am grateful to everyone who found their way back. I will flash you anytime you like. Melissa- Credit! That's the word I was looking for. Ruth- Thank you for knowing that! I'm gonna give it a shot. Quick question: where is the print screen button? Jenni- I'm sorry you were puking your guts out. That stinks. I've definitely told worse stories on my blog, so it's not TMI! Olivia- Great to see you too, and glad you got to meet Mary and Elana. Can you believe how many people were there? Crazy. Hopefully we'll be able to talk longer at the next one. I'll try to catch you at WJ. Bree- Um... You're welcome? And don't be silly- it's only the second photo that makes you look a little frazzled. The first one is perfectly normal. Nikki- So good to see you and catch up with the whole gang. Can't wait to catch up with Caprice and Wendy now! Sarah- I know. If only there weren't so many people there! Which is a good thing, I guess, but I feel like I didn't get to talk to so many of them. Point of clarification: you do not need to be a math wiz to lurrve Excel (the green one that came with your Microsoft Office package). Darn it, Jim, I'm a lawyer, not a mathematician. Excel does the math for you. Good thing, too. Sam--I'd be happy to make you your own spreadsheet for Tab. My high school drama teacher was a Tab drinker. Ah, memories. I didn't mention your name in my post today because I planned on saying more about you when I got the pictures, but I may never get the pictures and you deserve better than that - so I've now added your name not once, but twice to my post. Robin- "Darnit Jim, I'm a lawyer, not a mathematician." So funny! I bet if you asked, Bree would definitely go over her revision process, and all of the colors that go along with it, at the conference. You would probably get a kick out of it! Mary- You don't ever have to mention my name! I loved your post anyway. Of course then I spell your name wrong twice. Duh. Sorry Brodi. No worries. No one gets my name right! And I misspelled both Alaina's in my post.